Get INSTANT Access to Your FREE REPORT!!! Finally! Your Guide To Generating Targeted Traffic With Social Media. Stop wasting time! 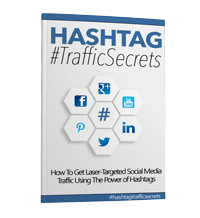 Become a social traffic magnet by learning these secret traffic strategies. Utilize hashtags to generate targeted traffic and sell your services to others.